HOLA! The Hot-Hot Just Love Walking LATIN MUSIC Podcast is here–Olé! This Just Love Walking Show: JLW 002 – WALK with a Latin Beat, is my tribute to Latin Dance Music*—the perfect upbeat accompaniment for walking! It’s a lively energizing mix of Latin music in the 120 BPM up to 140 BPM range, with interval speeds! You’ll find the passionate rhythms hard to resist! I’ve highlighted Tango in this Latin dance music mix because of it’s Latin origin, captivating ambiance, walking-conducive tempo and world-wide appeal, (even though ballroom experts classify Tango as a smooth dance, not Latin). Plus you’ll enjoy Merengue, Rumba, Salsa and more, including Latin/Rock fusion a la Santana style! Invigorating Latin Music companion for a 30-minute Walk! Music speed/tempo: 120–130 BPM, plus two Fast at 140 BPM! Interval speed/tempos – ramp up and down to change up the pace! I’ll tell you what’s coming up and cheer you on! This Podcast is also available for FREE in iTunes Store! Then open the MPEG with iTunes, or any other audio player. 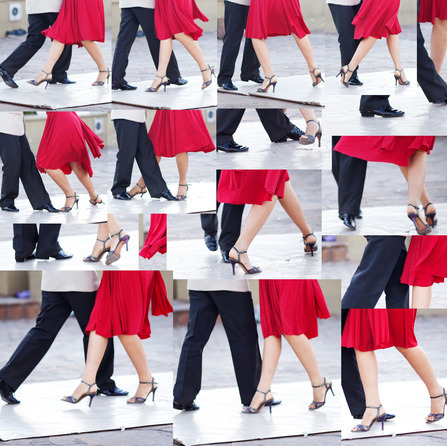 The featured photo of a man and woman dancing tango, shows dance footwear–shoes for general walking should be flat-heeled, flexible, comfortable, lightly padded with good support (as described in my Walking Readiness Checklist on the JustLoveWalking.com homepage). In future podcasts, I’ll be suggesting more ideas to make your walking experience challenging and fun! I encourage you to share your thoughts, too! Walking Tip: Use heel leads moving forward and use a rolling action, to exercise your feet more fully. This “heel lead rolling action” is a natural rolling movement starting with the heel and smoothly rolling through the foot from heel to toe. Please avoid slamming your whole foot down, but instead use this more gentle rolling action—better traction, smoother movement and healthier exercise for your feet. *From a traditional Ballroom approach, Tango is not normally referred to as a Latin Dance, but instead is classified as an American Smooth dance or an International Standard dance. But because of the Latin origins of Tango Music and Dance, I’ve included it in this Latin music mix (plus it’s a great tempo for walking)!